This novel, interdisciplinary text presents biological understanding in terms of general underlying principles, treating energy as the overarching theme and emphasizing the all-pervading influence of energy transformation in every process, both living and non-living. Key processes and concepts are explained in turn, culminating in a description of the overall functioning and regulation of a living cell. The book rounds off the story of life with a brief account ofthe endosymbiotic origins of eukaryotic cells, the development of multicellularity, and the emergence of modern plants and animals. Multidisciplinary research in science is becoming commonplace. However, as traditional boundaries start to break down, researchers are increasingly aware of the deficiencies in their knowledge of related disciplines. 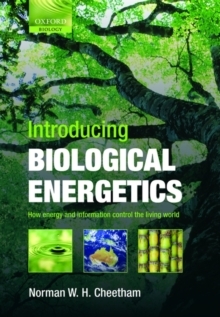 Introducing Biological Energetics redresses the reciprocal imbalance in the knowledge levels of physical and biological scientists in particular. Its style of presentation and depth of treatment has been carefully designed to unite these two readerships.